Could you please tell me how much this artwork “All Dogs Go to Heaven 3” would cost and how I would go about purchasing it? How much is all dog go to heaven,1,2,and 3,I have companions above the clouds with dogs in canvas, and love it,Got it on princess cruises. I saw this beautiful picture on facebook.Could you please tell me how much it is?I have Rainbow bridge and would love one of these pictures if there not to expensive. I love this, how much? This painting touches my heart as I have lost 2 true best friends and like to think I will see them in heaven. Can you provide me information and pricing for purchase. Thank you. This is the most amazing painting … it brought me to tears and truly touched my heart and soul! Can’t wait to have this in my home. This is so incredibly beautiful and moving. I just lost my dog this week. She was 16 years old and we’re heartbroken over losing a part of our family. There have been many tears and in trying to cope with the void left in our lives I stumbled across your artwork and just wanted to say thank you. You have an incredible talent and I thank you so very much for sharing it with the world. My grief and tears are still flowing but just seeing your images touches my broken heart in a way that is comforting during a time when very little comfort can be found. Thank you, Jim Warren. Please could you tell me how much a copy would be and how many in limited edition. Intrested in all dogs go to heavenand. You. Had 2 horse pics always. What is cost and are these oils, prints etc. Really Intrested. like my Sadie that passed away last December! same question as above. Could you please tell me how much this artwork “All Dogs Go to Heaven 3″ would cost and how I would go about purchasing it? I would love to purchase a print. Are you selling them by chance? Too bad horses aren’t included; imy older mare (she’s 28 yrs old) has cancer and will be in heaven soon. Thank you for any information you can share. Anita Dickens. Interested in print All Dogs go to Heaven. How much are the prints of “All Dogs Go To Heaven 3”? How much would a customized version be? Is the original for sale and if so what is the cost? I would like to know the same thing, the cost & how to purchase this print. I am also interest in this artwork. Could you please let me know the details? Please let me know the cost, including shipping, for All Dogs Go To Heaven 3. I lost my little dog 2 years ago. She was with me for 10 years. I still miss her so much, she was my best friend. My husband and I have recently been aboard the Norweigan’s Getaway and absolutely fell in love with your All Dogs Go To Heaven 3 artwork. We asked Norweigan how much it was and they told us it was $950. Can you tell me if that is the price, if if it comes in smaller canvases or can be bought less through your website? And if not does it come in prints and where may I be able to view them and the prices of both? I have a Facebook forum called RAINBOW BRIDGE PET MEMORIALS and my members are also interested in your work as well! Hi Jim. Would you please tell me what it would cost to do an original using my dogs in the art. Love your work! My husband and I just came back from a cruise of the Norweigan’s Getaway and inquired about the cost of you “All Dogs Go To Heaven 3.” They told me it was $950. A while back I have created a Facebook forum called RAINBOW BRIDGE PET MEMORIAL and posted your artwork showing it to my members. There are sevaeral interested members in it and as of last night two others had asked if I have received any more information on it! Can you tell me the cost of that canvas and if I can get other’s to buy iit if you would give a discount? I, myself is extremely interested in purchasing one and although I would assume it is available in prints , would like to know the cost of both. Patiently awaiting your answer! I love this picture. Could you tell me how much a print is & how to order from you please. Many thanks. What is the cost of the print “All dogs go to heaven 3” ? What are the sizes of this print? Am interested in All Dogs Go to Heaven 3. Can you please send me prices on your work for this print? I love what I saw of some of the rest of your work also. Amazing. How can I purchase a print and how much ???? I would like to know the price on All Dogs Go To Heaven 3. I came across it on facebook. A friend of mine shared it and my sister’s yorkie just passed away the day before. My sister is devastated and it was perfect timing. Please reply so that I may try and purchase this for her. How much is this print?? Omg love the all dogs go to heaven. How much for the 24/30 with or without picture of pet thanks awesome! Beautiful work ! Very moving … I was wondering what sizes and prices does all dogs go to heaven 3 come in . Also do u take special orders as far as what kind of dog u put in front of the bridge ? And do u ship to canada ? I too am interested in obtaining a copy of All Dogs Go To Heaven 3. When I saw this painting I was moved to tears. The little yorkie in this picture is my little Emma to a “T”, from the coloring, to the way she is standing. Emma crossed that rainbow bridge on Easter Sunday 2014 at the age of 7. The timing of seeing this painting was perfect, I now know she is happy and safe. After 22 years of being in business, I now have my very own grooming shop, very cozy, and I also have 3 best friends gone to the Bridge. I do so love this, and would like to order one. It’s just lovely. My best friend has a yorkie that is very ill and I would love to give her this print when he passes. Could you please let me know how much it cost. I live near Disney World in Orlando and saw that you have a couple of galleries there. Is this print available in the Orlando area? I am interested in purchasing all dogs go to heaven 3 please advise of the pricing. All Dogs go to Heaven 1, 2 or 3 . Beautiful !!! Can I purchase and Price ?? a kid. LOVE THEM ALL !!! What are the prices on the various print sizes. I’d love to get one for my vet’s office. I just LOVE the All Dogs Go to Heaven paintings – really touch my heart and yes, I do believe they will be there waiting for us to play! 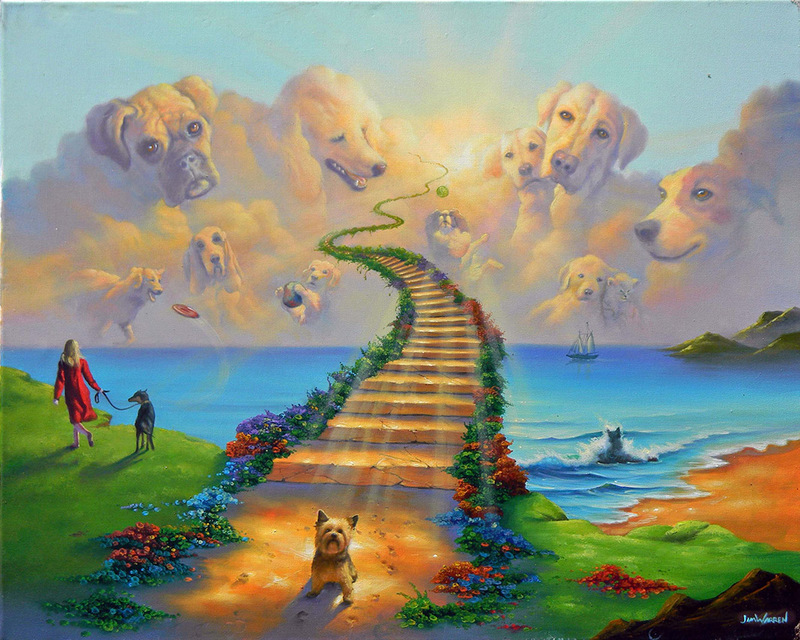 I would like to purchase a poster print of All Dogs Go to Heaven 3, but I do not see where to add it to Cart? I see the #2 poster for $60, which I love also… but one of the dogs in 3 looks just like my pup. How could I purchase a poster of 3? Thank you so much and thank you for all your beautiful works – I have several giclees I have purchased over a few years and I never stop looking at them, and find something new in them all the time. We are all so grateful for you! Was on a cruise on Carnival Pride on March 6th and I saw this beautiful print. What is the cost and if it is $950 are there any prints that are sold for less money. I think we all want to believe, and we probably are correct that our pets are still there in spirit, playing and doing the things we loved about them in the first place. For the limited edition prints I am often asked to paint the names of any pets they want into the steps as if carved in, subtly. Occasionally I am asked to even paint in their own dogs into the sky or on the ground below. I have even been asked to do commissions of an original painting using their dog, or dogs.